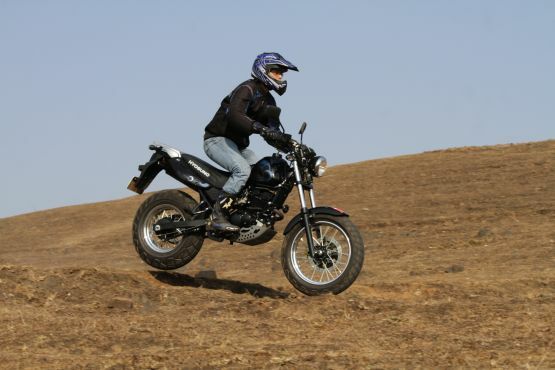 The RT125D is a quirky and fun-to-ride on- and off-roader from Hyosung. We take it for a spin and kick up some dirt while we’re at it. Korea, a land famous for its Kimchi, Tae kwon do and, lately, its global musical phenomenon, Gangnam style, is a country that’s known to stray off the beaten path every now and then. Thus when Hyosung showcased the RT125D prototype at the 2014 Auto Expo, a few eyeballs were popped due to its unconventional design. This is why, when we got a call from Hyosung informing us that the RT125D was prepped and ready for us, a Gollum-like grin spread across our faces. The RT125D is quite an attention-grabber thanks to its skinny frame that wears a set of humongous tyres. The overall design of the RT125D is based on the late 1980s Yamaha TW200 off-roader, aka the TeeDub. So far as the looks go, the bike perfectly fits the bill as an on- off-roader with minimalist design cues. That bulbous set of tyres, which are wrapped around spoke wheels, make the motorcycle stand out in a crowd. The halogen-powered headlight set-up provides good visibility at night, and the day-time running light, a simple tail-light and clear-lens indicators all do their job well. The tiny off-set digital instrument cluster unit has a no-nonsense approach and consists of all the essentials such as the speedometer, odometer, trip meters as well as a digital clock. The rear end of the RT also houses a baggage platform which is a welcome addition, especially during long rides, and an up-swept motocross exhaust sits underneath it. The motorcycle also sports a set of funky, Tsunami-inspired graphics on the 9.1-litre fuel-tank and the rear plastic panels. The RT125D is just like your typical off-road bike when it comes to the riding stance. Its slim seat is not the most comfortable, but provides an upright riding posture. The raised handlebar sports conventional plastic switchgear along with comfortable rubber palm grips. The machined alloy foot-rests keep the rider’s feet planted at all times and the square-shaped mirrors provide a high grade of visibility. When you turn on the ignition, you feel the grunt from the motocross exhaust and although the 125-cc engine is no growler, its unrefined exhaust note makes the RT’s presence felt on the road. is that it ? :/ a more detailed review please ?